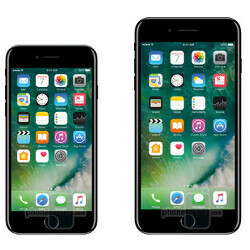 The iPhone 7 and 7 Plus release date is tomorrow, which one would you get? After an eventful preorder week, Apple is releasing the iPhone 7 and 7 Plus to the general public tomorrow, shipping units to those folks who already paid, and letting you go in carrier stores or third-party retailers to grab one on the spot. Besides changes in design like new black colors, a capacitive home key, axed audio jack, or antenna bands moved to the sides, the new iPhone 7 and 7 Plus are coming with brand new cameras with larger pixels. while optical stabilization makes a cameo on the smaller iPhone. The larger iPhone also arrives with two of those cameras, one with wide and the other with telephoto lens - an intriguing setup that surprisingly allows 2x optical zoom in such a thin phone. UK, Germany and France are of the few countries where new iPhones launch concurrently with the US, so the September 16 release date will hold water on the other side of the pond as well, that is why we wanted to ask you which of the two new iPhones would you pick. The 7 Plus is tempting with its dual camera, bokeh effects and optical zoom, but is more expensive, much larger, and not exactly widely available, while the iPhone 7 will sit as more manageable in the palm, and now comes with much improved battery life, too. Take your pick, and let us know your argumentation in the comments. Of course there had to be that one stupid guy who has to make Android users look bad by typing that comment. If you don't like the iPhone than why the hell are you even in this article? I thought the same thing after i open the post, cause i assume they would have a third option, but indeed they don't want the third option to have the most votes. They did have the third option it said "The exploding Note 7" but they removed it since you can't really buy that phone now. It was recalled. So it looks bad that they sold out of their stock?? I think it looks worst that there's a phone out there being used as a weapon. Dude, you're slaying them. Their comebacks are whack. Wow. You're sucking his đîčķ a hard as Phone Arena does to Apple. Why the hell did you come to an article that asks "if you were going to buy an iPhone which one would you get". A normal brain would work like this: "I'm not planning to buy an iPhone - I don't need to waste my time reading this". But your brain says "ooh Apple article - need to troll, now!" All that would prove is that 80 percent of the people in the comment section are Android fans. U need to talk only about yourself and if ure not gonna buy both then why the hell u wanna vote??? Dude, you should wait for the new stock of Note 7 first. Wait for it. Let it get tested then make your decision. Saying cuz I really don't think S8 is gonna something bigger than Note7 except the usual hardware update. Hey iPhonearena selection "NONE" missing..
Just ordered 2 7 plus for me and the wife. Delivers Oct 14th. Excited all over again. A Juggernaut is about to be release upon us. Like the 7 plus.